Are your mobile users enjoying the same level of attention your desktop users do? With over 60% of users accessing the Internet from mobile devices, the days of a one-size fits all website are gone...kinda—if your website isn’t easy to read and navigate on mobile devices, your visitors will go somewhere else. Why is a mobile website important? In April 2015, Google released an algorithm ( coined Mobilegeddon ) that specifically focuses on giving preference to mobile ready websites over non mobile ready websites in mobile search results. Beyond alienating your website from Google’s standards, the user experience is extremely compromised and has the potential to not only loose potential business, but negatively impact your brand. Nearly all cellphone plans include data making the internet more accessible anytime from anywhere. Two-thirds of Americans access the web from their smartphone. 40% use their phone as their preferred or only method of getting on the web. 89% of purchases start with search. You only get one chance to make a first impression. When new visitors access your site through their mobile device, what impression do you give? Mobile is an additional channel to generate more leads, provide better support, and do business more efficiently. For many website owners, creating a quality mobile user experience without adding long term business resources to manage multiple versions of the same site or multiple hosted sites requires a little upfront planning and effort. In its basic form, a responsive website design will utilize one version of content and deliver that content fluidly based on the size of the screen that is requesting it. Font sizes, image sizes and content layout are all adjusted to fit the screen that the user is viewing without requiring additional website management. 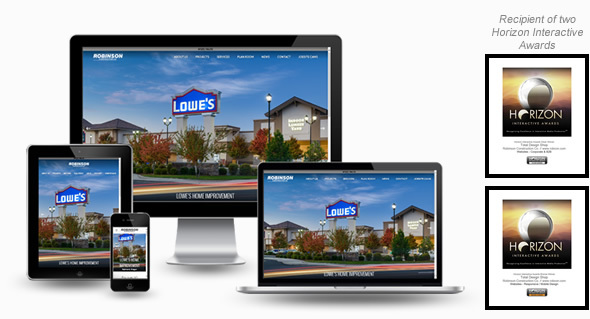 We are responsive website design experts. Providing the highest quality user experience across multiple operating systems, browsers AND devices is our primary objective and we are here to help. Let’s talk about your current website and create a winning game plan. For a free, no obligation evaluation and estimate, contact us today. "The website redesign was an overwhelming success and within the first month our organic rankings are on the rise and traffic has increased 245%. More importantly for us, the site optimization has yielded an increase of 1,900% in leads within the first two weeks and all leads generated are considered to be high quality." "It is not only what I asked for, but is easy for me to change when necessary. Not only did the Total Design Shop team work with my short time frame, they also worked within my budget. I highly recommend them to anyone who needs a quality web design team."